Swedes had to wait until the new year for "real" 1976 models of 95 and 96. Before that they had to be satisfied with 1975 B models. The home market versions of the 95 and 96 for 1976 came out in two stages: in August 1975 and just after the first of the new year. Fall models were called 1975B, but carried all 1976 features except for the engine which was being re-engineered to meet new Swedish requirements for exhaust emissions. After the first of the year, the power output sank a bit. Specifications list 62 hp for cars for Sweden and 65 hp for other markets. Both 95 and 96 had the same impact-absorbing bumpers as the 99, and also much more legroom for backseat passengers (thanks to the fact that the back seat had been moved further back); new steering wheel and improved instrumentation. All had steel belted tires as standard equipment. Scandinavian cars also came with head restraints and improved lighting; left-hand-drive 96 also with electric rear window defroster; and all of them had wider wheels. The 95 lost the extra rear seat and got its spare tire relocated under the rear deck. In all, the changes for the V4 series were the most wide-ranging in nine years of production. The increased comfort level and the added equipment led to the designation L - for De Luxe. Many 95/96 changes for 1976 - especially those for the rearrangements of the seats - were based on ideas from the fall of 1973, when Saab studied the possibility of one replacement for both of them. This was planned as a Combi Coupe version, as long as the 95 but more a sedan than a station wagon. A couple of test cars, like these, were built but the project was eventually abandoned. 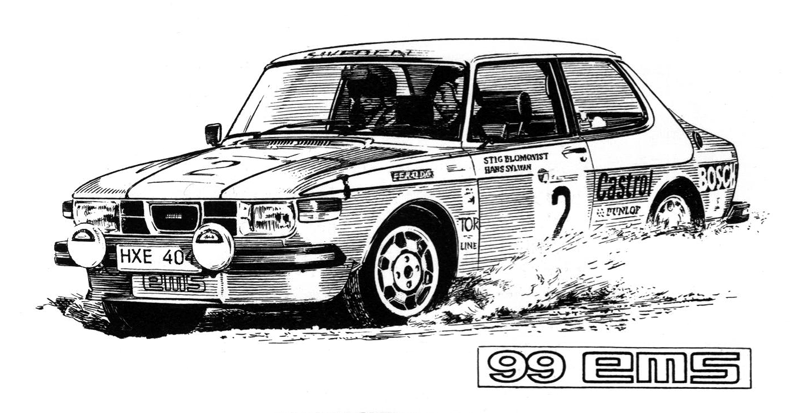 Saab was in no rush to let the 99 show what it could do in competition. It was heavier and wider than the 96, had less ground clearance and was made for smoother roads. But it wouldn't hurt to prove that the 99 too could show its performance, if it just got enough power. The Competition Department worked with the engine technicians. 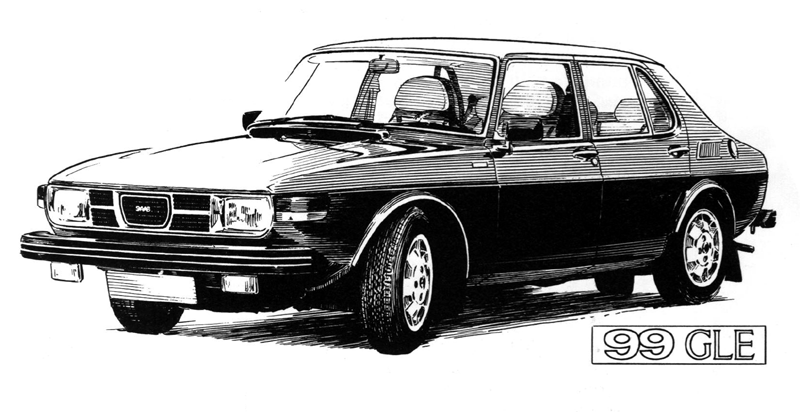 And in February of 1976, the Saab 99 made its competition debut. A rally equipped EMS with a 220 hp 16-valve engine was put into the hands of Stig Blomqvist for the Belgian Boucles de Spa Rally, a part of the European championship. The result: first overall. Meanwhile, however, designers and testers at the Saab-Scania engine laboratories in Sodertalje were proceeding along different lines than the high-compression twin-cam concept. When Blomqvist won in Belgium, work had progressed so far that it appeared feasible to series build a turbo-charged normal engine for everyday use. The first Saab Turbo was presented in the summer of 1976 so that testing could proceed without undue secrecy restrictions. The fall news for the 99 for 1976 was considerable, but not exactly revolutionary. 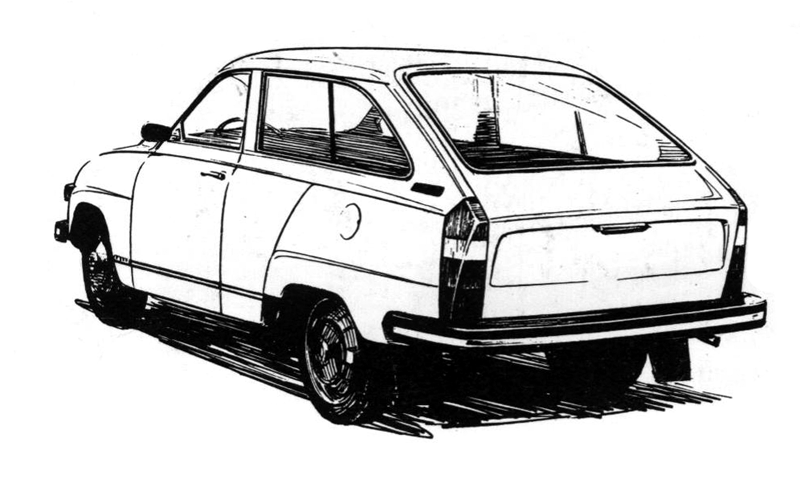 The clutch had been improved; the headlights (the rectangular ones for Europe) offered a better low beam light pattern; all wheels had five inch rims; engines were adapted for more strict emissions requirements; most models had electrically heated rear windows; the rear axle cross members had new fastening points; etc. A yellowish light green (Opal) replaced Emerald Green in the color program and orange made way for Topaz Yellow. Beige was a new upholstery color, after green, and the baggage compartment had more elegant trim. Hubcaps also featured a new design, and the EMS sported wider side moldings. At about the same time as the one millionth Saab rolled off the line in January 1976, the 99-model line got a fresh addition. A new "combi sedan" with four side doors and a rear hatch was introduced. The model was positioned in the middle of the range, now called GL. At the top of the line was the GLE, a four-door sedan with fuel injection engine, automatic transmission, power steering, alloy wheels and top notch interiors. The EMS received low profile tires, a front spoiler, gas filled shock absorbers, stiffer suspension and more direct steering, all for more sportiness. GL models with twin carburetors were designated GL Super, and versions with fuel injection "GL injection". Base models were called 99L. Model line up, latter part of the 1976 model year. The winner of the first 1976 European Championship, The Belgian Boucles de Spa: Behind the wheel, Stig Blomqvist. Co-driver, Hans Sylvan. Car: Saab 99 EMS, 220 hp. At the 1976 Brussels Auto Show the luxury model GLE was first shown. Standard equipment included rear seat head restraints, electrically controlled outside rear view mirrors, and alloy wheels with gold painted insets. New hubcaps, wider rims and side moldings distinguished the 1976 GL models on the outside. A newcomer was the five-door model. The "opera windows" were put in to allow better rear vision. For markets in Europe the model was only offered with the Super (twin carburetor) engine. All 99s for the U.S. used fuel injection. Power steering was also available in the GL series.